A few months ago, I was tempted to make rainbow cupcakes. I used Wilton coloring with the result as the below picture. I showed it to my friend and she said that the colors are not really attractive since it's too soft. I guess she actually meant my rainbow cupcakes look dull, hehehe. Well, Wilton's colors produce their best for pastel colors and there's no any other food colorings to find here in Jakarta, better than Wilton's product - I think. I noticed that many of the American food bloggers are using Americolor product for food coloring. So, when Lynn told me that she's coming to visit me in July and asked me what I wanted from the States, the first thing that came up in my mind was those beautiful Americolor food colorings. FYI, Lynn was a Singaporean blogger who is living in the States. I've known her for more than 4 years in the blogsphere but not until last year, when I finally met her in real person for the first time in Bali. We had a wonderful time traveling, shopping and eating together around Bali for 3 days. Anyway, Lynn canceled her trip to Jakarta for the security reason (remember the Jakarta's bombing at those 5 stars hotels last July? ), thus she sent me a parcel. 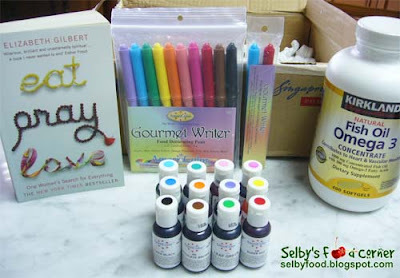 In the parcel, it contains the book "Eat, Pray, Love", 1 bottle of Omega 3 supplement, 1 set of gourmet writer plus extra 2 pens, and 12 bottles of Americolor. Yay!!! Thank you so much, dearie! So... today, I couldn't wait to try out to make the rainbow cupcakes again and this time, I'm using the Americolor, yipeee!!! - In a medium bowl, mix together salt, baking powder and flour. Stir to combine then set aside. - Cream butter and sugar together in a large bowl, then add in eggs, one at a time. Add vanilla extract and the seeds of half a vanilla bean. Beat until well combined. - Alternately add the dry ingredients and the milk to the butter/sugar mixture. Start with flour, end with flour. - Divide the batter into 6 bowls. Color your batter with food coloring (red, orange, yellow, green, blue and violet). 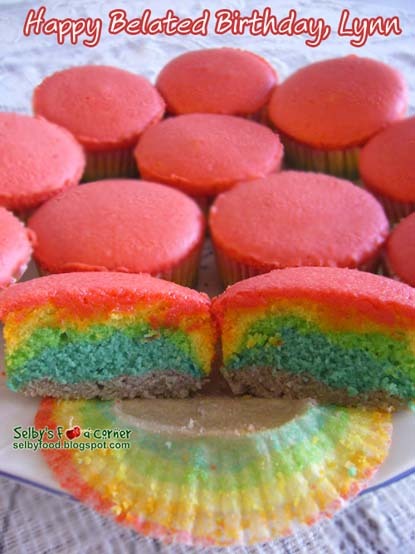 - Spoon or pipe your batter in thin layers into the muffin cups, being careful not to mix the colors. - Bake at 375 degrees for 18-20 minutes for 20 regular cupcakes. wow this so wonderful, so full of wonders! ;) lovely and colourful! Selba, they look beautiful. Absolutely gorgeous. Great job! Wow there you go .... really rainbow huh! What a lovely blog friend, so great you got to meet and had a blast together. I loved your giftpack, shame you had to go through so much trouble. pretty cuppies!!! Happy Birthday Lynn! They really do look wonderful. I hope your friend had a terrific birthday. Oh wow such a colourful cake. It looks fabulous. How fun are these?! They look bright and wonderful to me! I love the addition of double vanilla and the vanilla bean, yum! Thank you sweetie!! And big thanks to Dustjacket Attic, ♥peachkins♥, and Mary for your compliments and birthday wishes. I did have a wonderful birthday, I ate like a pound of meat at Fogo de Chao. Selby darling, it's a shame that I could not make that Jakarta trip. First I was plagued by a bad stomach flu (not H1N1 lah), and then the scary bombing happened ... But I am so glad that I am still able to put a big smile on your face, despite all the trouble you had to go thro'! I will PROMISE to use your official name on my next parcel to you ;D Just yell when you run out of colors, OK? Miss you so much! Oh I want some of those for my birthday...well it was in June, but no one made me a cake, not even myself for self...What a nice care package! These cupcakes make me feel happy! They are SO CUTE! These look so adorable, love the bright colors! Oooh, these are so pretty! These lovely cupcakes would brighten up anyone's day! Wow, what a treasure box you received. I love the book, I have read it twice now. It is good for the soul. 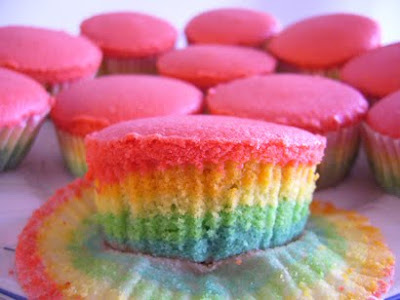 The rainbow bakes look delicious, I never knew to add food coloring to that extend. Thanks darling for sharing. Darling, I love music and these are wonderful, but help me out here, there is no link to the photos, so what you are doing is simply letting us know about them and then we go on our own treasure hunt? Or is there some trick to it that I being so computer illiterate doesn’t get!! I will look them up in the meantime. Thank you darling and have yourself a wonderful day. What beautiful cupcakes; such bright colors! Very good job, Selby! MOS: Hi dearie… I’m so glad that you had a wonderful birthday. Wow! Fogo de Chao? That’s a great authentic Brazilian steakhouse! I have heard of it and wish that I could try it someday. ck lam: Yeah… it is, hehehe…. lovely colours...it is like an art for me...how can i give a bite on it?! Those cupcakes are so adorable! 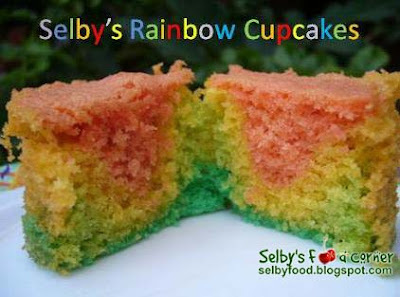 I definitely want rainbow cupcakes for my birthday, please come make me some Selby! Can see the difference from the colours! So it is better than wilton's?? the colours look so vibrant that im hesitant to put it in my mouth..
What adorable cupcakes!! You did an awesome job, I'm glad you got your package ok! yak! honest to me,it looks so artificial. foodbin: hahaha…. You meant the colors look scary, ya? WOW! Beautiful! And what a great package! Those cupcakes are beautiful!! I never would have thought you could make a rainbow cupcake with such distinct colors. I'm so happy you were able to get the package with all that fun stuff!! Wow, well those aren't soft at all :) Haha great job. It's pretty interesting that you'd like to get some stuff from the States... here I am reading and I see all this cool stuff in Jakarta that we don't have here! lori: thank you, Lori :) The Americolor has very beautiful and distinct colors. Yeah, I'm so glad that finally I could get the parcel after all the trouble that I had to face, hehehe. michelle: Hi Michelle, welcome to my blog :) The Eat, Love, Pray book is very interesting to read, I really like the way of Elizabeth Gilbert's writing. Selby your cupcakes turned out wonderfully! They look so good I want to make them again. If I close my eyes I can almost taste them. Great care package. I love that book! Those colouring look like our colour pencils!!! I would be perfectly happy with either of those sets of cupcakes. How fun and cute! Nice exciting colours! But not from the generation that can put these colour into the mouth! I never thought food coloring between two brands could be so different! 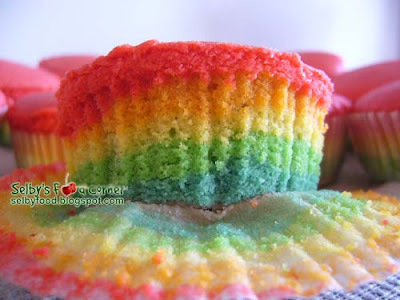 The Americolor color in the rainbow cupcakes looks fantastic :). So vibrant! I like all the layers and how uniform they are, as well as the little waves in each layer. worldwindows: Hehehe... too much colorings? Your cupcakes look great. You are a genius! The colours are so vibrant! Great work. I keep seeing rainbow cake posts around blogland and am getting the feeling that I'm missing out on something. Your mini rainbow cakes have inspired me to try this myself. Wow, your cupcakes look so cute! Those colors are great, and what a nice package to receive! Omg, those are PERFECT! Fun to make and fun to eat. lisa: thank you, Lisa :) I'm so happy with the result of the colors. Holy cow these are wild! Love the colors. I didn't know that there is a significant diff between Wilton colour and Americolor until I read this post. So impressive! Your cupcakes look marvelous and nice shots too! Cool Cupcakes Selba! My kids would love these of course. cucinista: Hi Cucinista, thanks for stopping by my blog :) Hope to see you again here! FFT: thank you.. thank you... :) Frankly speaking, I also didn't really aware of the difference between the colorings until I played with fondant and made the rainbow cupcakes. Oh my goodness, your cupcakes are SO beautiful! I am so impressed with your perfect color layers - in both of your cupcakes batches! astra libris: Hi Astra, welcome to my blog and thank you so much for your kind compliments on my cupcakes and blog :) Please come again! Wow these are gorgeous! Thank heavens for foodie blog friends around the world! glo: thank you, Glo :) Each brand totally gives a different result. What a big difference between Wilton and Americolor. Your cup cakes really have some pow going for them! So glad you were able to get your parcel out of customs. My first time here in your blog, and I am loving every bit of it, especially the street food series....!!:-). I miss Indo siomay, especially the one from TA - apparently not very hygienic there, but it's fantasically yummy....!! Gorgeous cupcakes and I am so glad your baby is feeling better! KA: Now, we know if we need pastel color, we use Wilton and for strong sharp color then, we use Americolor :) It's a big relieved that I could the parcel out at last. cheryl: Hi Cheryl, welcome to my blog :) My baby? Oh.. you meant Bella? Hehehe.. Yeah, so happy that she is back healthy again. molly jean: Hi Molly, thanks for stopping by my blog :) Oh.. what happened to your layers? DoT: you are missing again, Duchess? jennifer: Hi Jennifer, thanks for stopping by my blog and also for your compliment. What pretty cupcakes! So perfect!